Poole Borough councillors discussed a new tourism action plan to attract more tourists to town in a meeting last night. Graham Richardson, manager of Poole tourism management board introduced a targeted spring advertising campaign promoting “Back in Britain” “to take advantage of people holidaying at home”. 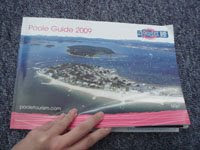 The tourism management board also set up an “overseas promotion” to promote Poole as a cruise ship destination. There will be daily trips from Channel Islands and France to attract French people to Poole. Graham Richardson emphasized the importance of the restaurants and pubs in the Quay and offered restaurant promotions and further positioning of Poole's quality eating out product. He said: "The smoking ban led more people outside during summer when the weather is nice." The action plan aimed to raise profile of the emerging quality independent retail offer of lower high street /old town within the Poole Quay mini guide. Cllr Michael Brooke told the councillors that there is a changing “character rather than emerging quality” of the retail shops . The councillors also discussed further developments on the Poole tourism website, visitor guide and welcome centre in the meeting.